Kenyan security forces walk away from the hotel complex at the scene of the attack in Nairobi, Kenya, Jan. 16, 2019. Kenya's president on Wednesday vowed to track down terrorists who staged a deadly assault the day before on a hotel-and-office complex in an upscale suburb of Nairobi. President Uhuru Kenyatta said all attackers had been "eliminated" and warned his government was launching an aggressive manhunt for all those involved. Police said at least 21 people had been killed at the capital's Dusit D2 complex, where surveillance video showed at least four gunmen walking through the parking lot as the siege began in midafternoon. The Islamist extremist group al-Shabab claimed responsibility for the attack, which began with an explosion outside a bank and a suicide bombing in the hotel lobby. Authorities have not confirmed the group's claim. However, al-Shabab has been linked to previous attacks in Kenya, including the 2013 attack on Nairobi's Westgate Mall, which killed 67, and a 2015 attack at Garissa University College, which killed 148. An official with the Kenyan Red Cross told reporters that 18 people had been injured and roughly 700 evacuated from the Dusit complex by security forces. The dead included two Somalis, a British man and an American. The American killed was identified by family members as Jason Spindler, who worked in Nairobi as chief executive officer of I-DEV International, a business strategy and investment firm. His father, Joseph, told the Associated Press that his son frequently ate at the hotel cafe, where he was shot. Kenya's Interior Minister Fred Matiangi speaks to the media at the scene of an extremist gunmen attack in Nairobi, Kenya, Jan. 16, 2019. A graduate of New York University's law school and of the University of Texas-Austin, Spindler had worked in finance but joined the Peace Corps in Peru after the 9/11 attacks in 2001. He would have turned 41 next week. "It is with a heavy heart that I have to report that my brother, Jason Spindler, passed away this morning during a terror attack in Nairobi, Kenya. Jason was a survivor of 9/11 and a fighter. I am sure he gave them hell!" Jonathan Spindler said in a Facebook post. Two of the other victims, Abdalla Sheikh Mohamed and Feisal Ahmed Rashid Dahir, were also having lunch when they were killed on the terrace of a restaurant in the complex. Both men had worked on the Somalia Stability Fund, a project to bring peace and prosperity to Somalia through various community initiatives, their employer said. Dahir, 31, was born in Nairobi and married last year, his father, Ahmed-Rashid Haji Dahir, told VOA's Somali service. He said his son's wife was seven months pregnant. The elder Dahir went to the mortuary at nearby Nairobi University after another son phoned him with the bad news. "I was still hoping that I will find my son alive," the father said, "but late in the night they brought in eight bodies, including my son and his colleague, Abdalla." Abdalla Mohamed was 27. On his Twitter account, he described himself as "just a normal lad from Kenya." Mohamed's uncle, Yasin Jama Ismail, told VOA Somali the young man was helping his siblings with school fees. Ismail said he could not understand the alleged al-Shabab attackers' motivation. "The ones who brought this pain to me are carrying our name, Islam. I am also a Muslim," he said. "The question I'm asking: Why are they killing human beings?" In his address, Kenyatta said security forces were taking steps to prevent further attacks. "Multiple security efforts are under way to detect, deter and disrupt and defeat any terrorist operatives or groups," Kenyatta said. "We are also on highest alert and shall remain so. I assure every Kenyan and our foreign visitors that you are safe in Kenya." 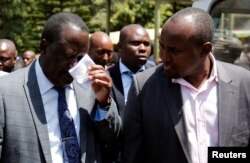 Opposition leader Raila Odinga of the National Super Alliance (NASA) coalition reacts at the Chiromo mortuary, in Nairobi, Kenya, Jan. 16, 2019. 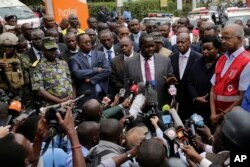 Opposition leader Raila Odinga called for Kenya's cohesion, saying that "divisions are what terrorists thrive on." VOA Somali service's Harun Maruf contributed to this report from Washington.